Who can cause a sensation at the IAA 2014? MAN kann. A lion’s head made up of thousands of light-emitting diodes glows an orange-red in hall 12 at the trade fair grounds in Hanover. It is being tamed by Philipp Diehl-Thiele, lord of stage production for the MAN stand at the IAA 2014. He and his team have been directing around 1,200 spotlights along with cameras and screens for two weeks now. They allow the star of the MAN show to take the stage in front of the central 60m² LED screen when the time is right: the MAN TGX D38. The IAA motor show is a big stage for many new products, and it is here that the new flagship is also being presented to the general public for the first time – a première that will not be forgotten. This is not only due to its handsome looks, but to the many stand staff and helpers who are on hand to answer any questions about all the vehicles and products that the trade fair visitors might have. The experts talk about “their babies” with pride. 13 shows take place on the big stage every day. Together with the product experts, presenter Nina Moghaddam takes the visitors on a journey into the worlds of MAN and NEOPLAN: Todor Valchev talks about the successful test drive of the MAN TGX EfficientLine 2, Heinz Kiess about the future of coach travel and the NEOPLAN Skyliner, and Monika Roither about the technical highlights in the TGX D38. The MAN experts provide the information and the content for the shows while Diehl-Thiele and his team ensure that they are presented correctly. Timing is incredibly important here. It is during these very minutes of the show that Diehl-Thiele and his staff are at their best. They control lights and images at consoles with hundreds of switches. The work well together, having rehearsed beforehand. “There are no mistakes here, after all we are at MAN,” says Diehl-Thiele with a wink while wafting mist over the new D38 engine. By “here” he means the 10,000 square meters that MAN is presenting on. Sascha Jennewein has overall responsibility for the IAA project for the ninth time. What is special about it for him this year? “The new concept has not only worked out and well at that – it is also being praised by everyone! The stand is bright, friendly, and open. It invites our visitors in to linger. They are able to discover the individual segments and brands and experience an environment in every area that is very close to the real field of use for the vehicles. It is well received by our customers,” he enthuses. Sascha Jennewein and his team deal with the concept and the organization as early as one and a half years before the trade fair starts. “After the IAA is before the IAA,” he says smiling. But it is the last three months that are really hectic. And then there is the setup, which started 40 days before the trade fair opened this year. Around 120 workers helped to make the vision a reality. They laid down more than 15 kilometers of cable, built up more than 120 doors, and positioned more than 1,200 chairs. The number of brochures and posters that MAN hands out to fans and interested members of the public is just as impressive: over 100,000 printed materials in total. That is the equivalent of 60 Euro pallets transported by two fully loaded semitrailer tractors from Munich to Hanover. “The new product brochures and the MANmagazin in particular are a hit with our visitors,” says Thomas Mahler, responsible for the MAN Truck & Bus Publication Store, with delight. With all this thirst for knowledge, the visitors also need refreshments which is a lion’s task for the catering crew: 30,000 liters of beverages and over 40,000 pretzels and sandwiches are served to the visitor’s at MAN in just under two weeks. This is on top of 11,000 lunches and 20,000 sausages. An amazing feat of logistics. It is precisely those words that the MAN team work for before and after the IAA. A day at the trade fair is challenging, requiring endurance and constant attention in order to offer visitors a perfect day. If they visit the MAN stand with a smile and go home satisfied, then they have answered the question about who can cause a sensation at the IAA: MAN kann. Presenter Nina Moghaddam and MAN bus expert Heinz Kiess during one of the many MAN shows. 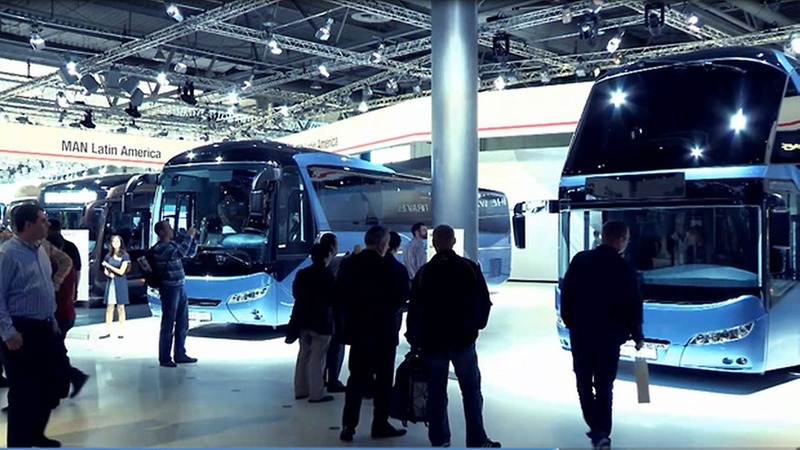 Visitors were able to gain a glimpse into the new MAN and NEOPLAN models in relaxed stage events. Heinz-Jürgen Löw, the Executive Board member for Sales & Marketing at MAN Truck & Bus, receives the award conferred at the IAA. The MAN Lion’s City GL CNG was voted best bus in the field by European journalists. Father and son on the road with the MAN TGX D38. Norbert Ruhnke and Kai Rosenwald were impressed with the new flagship’s power during their test drive. Heinrich Degenhart and his MAN ProfiDrive colleagues enable the numerous visitors interested to test drive MAN’s new top models. And he has nothing but good things to say: “We have had extremely positive feedback about the MAN TGX D38,” he explains. Monika Roither is on hand to answer any questions the visitors might have about the TGX D38. She has found that the visitors are thirsty for information and thrilled with MAN’s appearance at the IAA. Philipp Diehl-Thiele and his team are responsible for ensuring that the technical processes at the IAA run smoothly. Sascha Jennewein is responsible for organizing the IAA. His highlights this year: the children’s discovery tour and the TGX D38 photo box. Thousands of visitors flocked to see a special type of lion: the MAN TGX D38. But there are many innovations and great exhibits to the left and right of the new flagship. The new in-line six-cylinder engine in the MAN TGX D38 achieves top marks. For friends, fans and anyone interested: the MAN WebKiosk. Full of exciting news and facts to browse or download, the MAN WebKiosk contains all MAN magazines, our company reports and the latest brochures for MAN services, MAN trucks and MAN buses.